You've seen Bushwick's golden glow splendor at sunset - but what happens after the sun goes down? 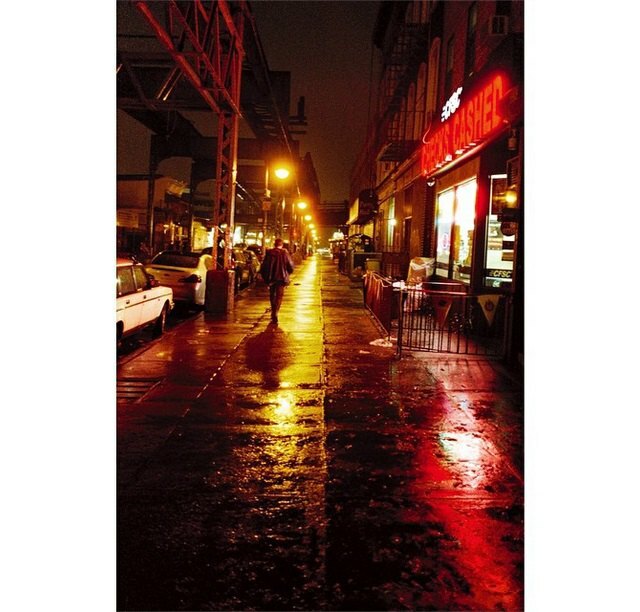 Bushwick Daily photographer Alonzo Maciel arrives at the scene to capture the evening streets in all of their calm, neon-lit glory, that's what. He took the streets for a #BushwickAtNight-themed Insta-Takeover last week, and captured some eerily empty, yet so perfectly serene, shots on film. (We'll blame the rain for keeping people inside.) Let's play the numbers game again, shall we? You all favorited Alonzo's photos 2,100+ times in one week. And that's only counting Instagram. I do not lie when I say that you'll definitely want to check these dark photos out. Alonzo is a Bushwick-based portrait photographer who moved to NYC in 2012 from LA, and has always gravitated towards analog film and Polaroids. He says, "It forces me to slow down and concentrate on the image versus simply shooting an excessive amount and hoping you got a usable shot...[and] it simply looks better. Ha!" Alonzo enjoys the solitude of walking around at night, especially in this city. "People typically don't bother you, and places that are usually loud and overcrowded are still and just asking to be captured. So with that in mind I walked around Bushwick in all hours of the night...and photographed our neighborhood." We're so glad you did, Alonzo. So glad you did. Alonzo just completed his first self-published photobook that contains Polaroids captured between 2007-2014. (It sold-out at BOS 2014!) He also plans to continue the "Bushwick at Night" series and have a show up by next spring. Check out #BushwickAtNight's humble Insta-Takeover beginnings below, and make sure to catch the rest of his pics on our Instagram page. This week's Insta-Takeover: A Halloween-themed week from Joey Prince. Keep your eyes peeled! Wanna be the next Insta-Takeover photographer? Just fill out our little application HERE!